How Bad was Mohammed Morsi? Egypt's President for One Year, Mohammed Morsi, was widely reviled for incompetence and autocracy. When he was overthrown in a military coup, our Secretary of State called this "restoring democracy." But how bad was he, really? Political scientists Shadi Hamid and Meredith Wheeler analyzed Morsi's tenure in office using the Polity IV Index, a tool for rating the level of autocracy or democracy in any given government. They then compared Morsi's rating to those of other countries undergoing a transition to democratic rule. A rating of 2 turns out to be about average for countries undergoing such wrenching changes, even above average by some criteria. This is what I thought at the time. As a secular person and a strong supporter of women's rights, obviously I found a lot to dislike about Morsi. But he won the election! He feuded with the courts and at one point announced that he would ignore them, but the courts really were a holdover from the dictatorship and they were determined to block him in whatever way they could. At least he never threatened to have the judges shot. He never did anything nearly as appalling as the latest affront from the new military regime, which proposes to execute more than 500 members of Morsi's movement for the death of one police officer. 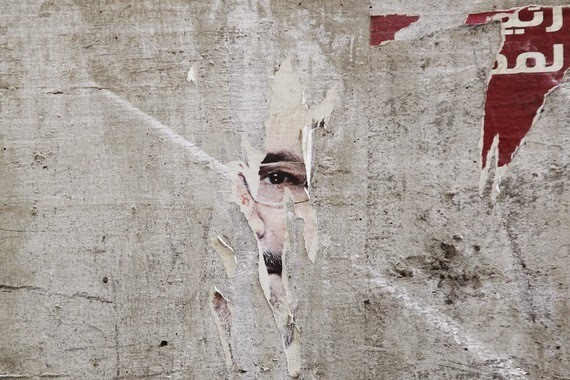 It may be decades before Egypt recovers from the trauma of Morsi's election and overthrow. That Morsi's term in office turned out so tragically was, I think, substantially his own fault. If he had given his political opponents any reason to trust in his fairness, if he had allowed secular lawyers to make any modifications to his proposed constitution, if he had made any effort to reassure US and European leaders that he would respect human rights and not support Islamic terrorism, he might still be President and Egypt might be continuing down the always-rocky road toward democracy. But he would not. He would not partly because of what came before, that is, 40 years of oppression toward his movement and their allies. Such a long legacy of hate and mistrust is hard to overcome. In these special, revolutionary circumstances, it clearly matters a lot whether the right leader can be found. We have the preliminary data from the geophysical work that Tim Horsley carried out for us in Patterson Park. The magnetometry does not seem to have produced much, because there is just too much metal. But with the ground-penetrating radar Tim was able to map out the fortification ditch very clearly. You can see the overall plan above and a detail below. Yippee! And now I try to catch up on the rest of my life before we start the rest of the fieldwork on April 15. Tillia Tepe is an archaeological site in northwestern Afghanistan, where the mountains run down to the vast central Asian plain. 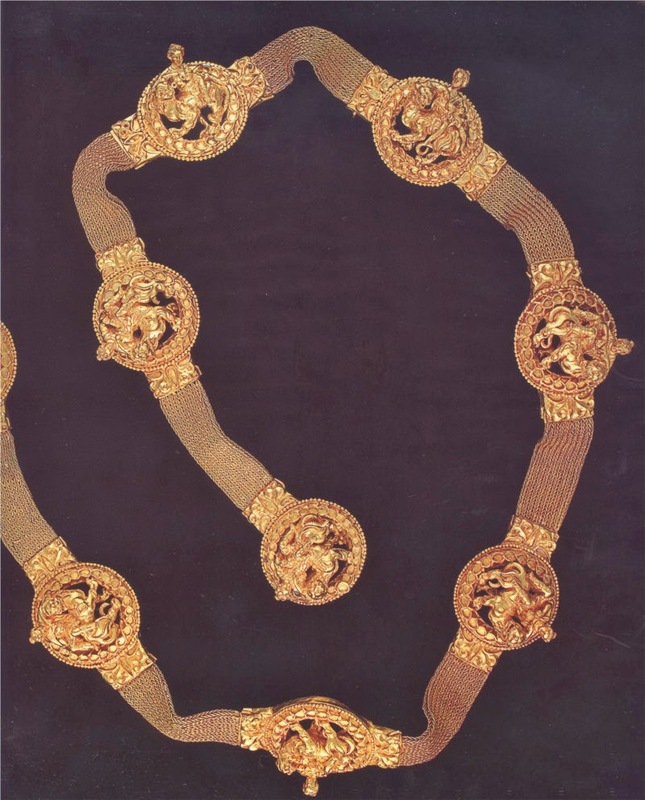 It was excavated in 1978 by Soviet and Afghan archaeologists. 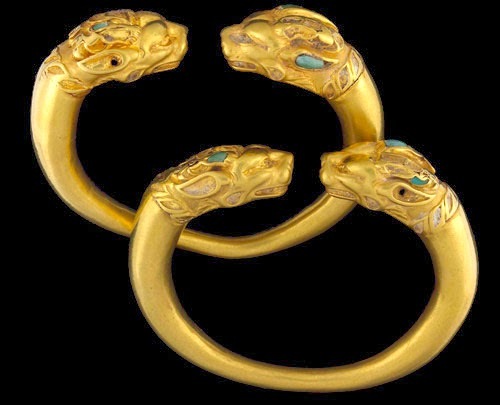 Within an old fort dating to the Bronze Age were six princely burials dating to between 100 BCE and 100 CE. The people buried here seem to have been nomads, although exactly what sort remains disputed. 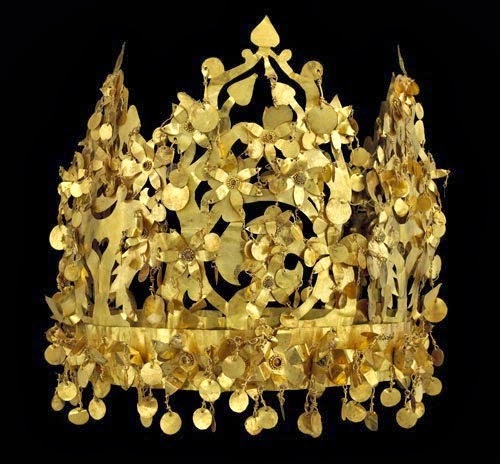 Above, gold crown that was found disassembled, as if for carrying on nomadic journeys. 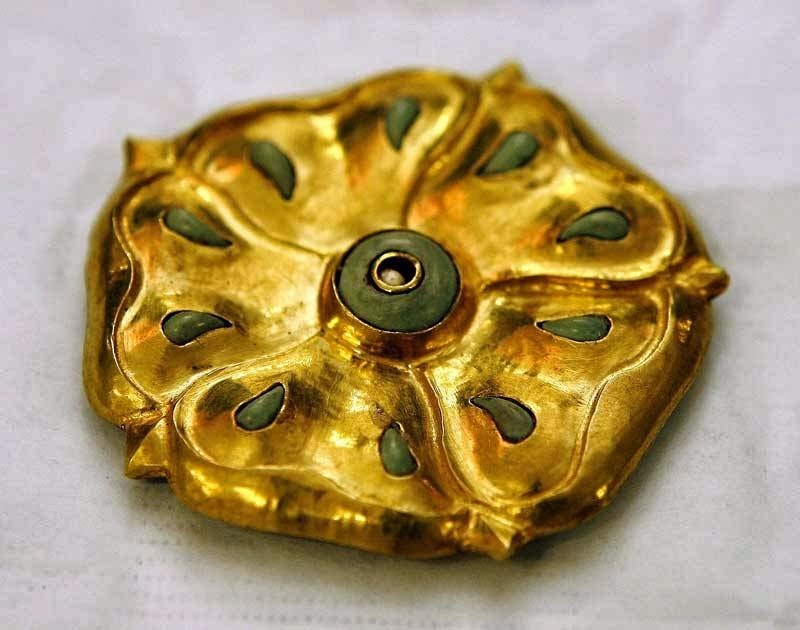 The six burials produced more than 20,000 pieces of gold, many of them small appliques like this one from Tomb VI. 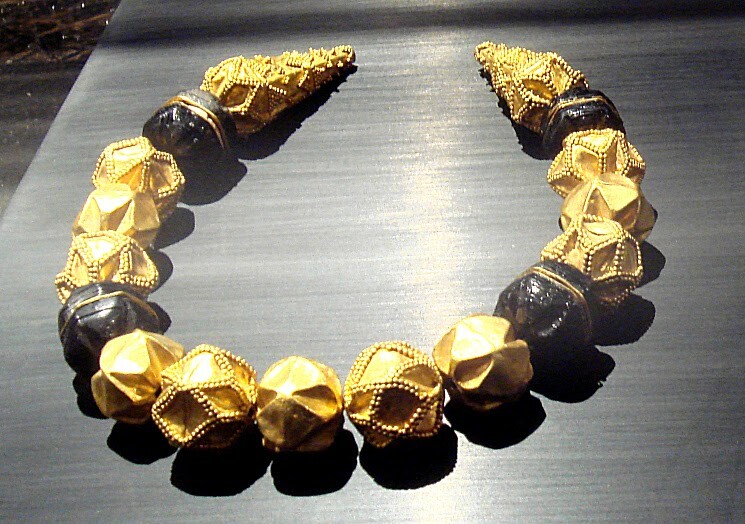 Bracelets and necklace from Tomb II. 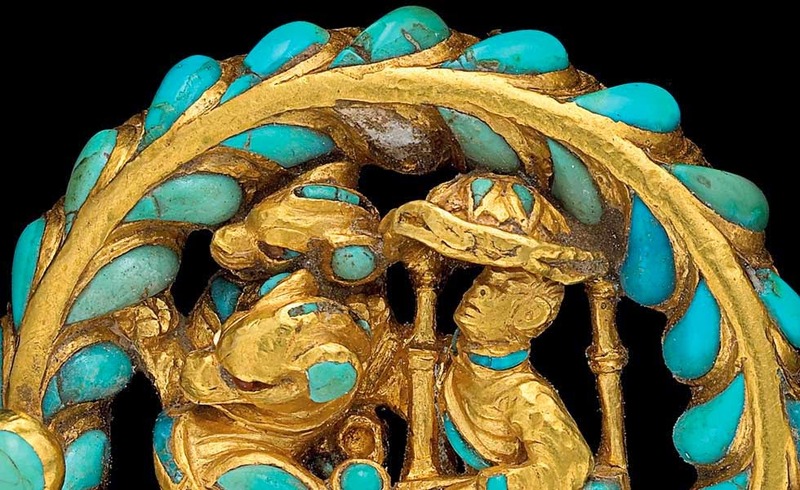 One of the fascinating things about the artifacts is the degree of cultural mixing they represent. 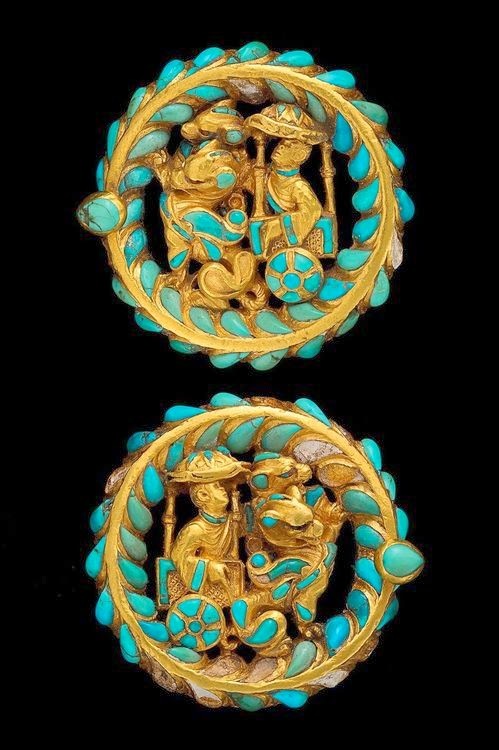 These two gold, turquoise and carnelian boot buckles from Tomb IV depict a chariot drawn by dragons in a Chinese style. 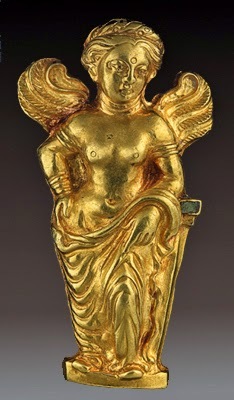 Other pieces look like Hellenistic Greek work. 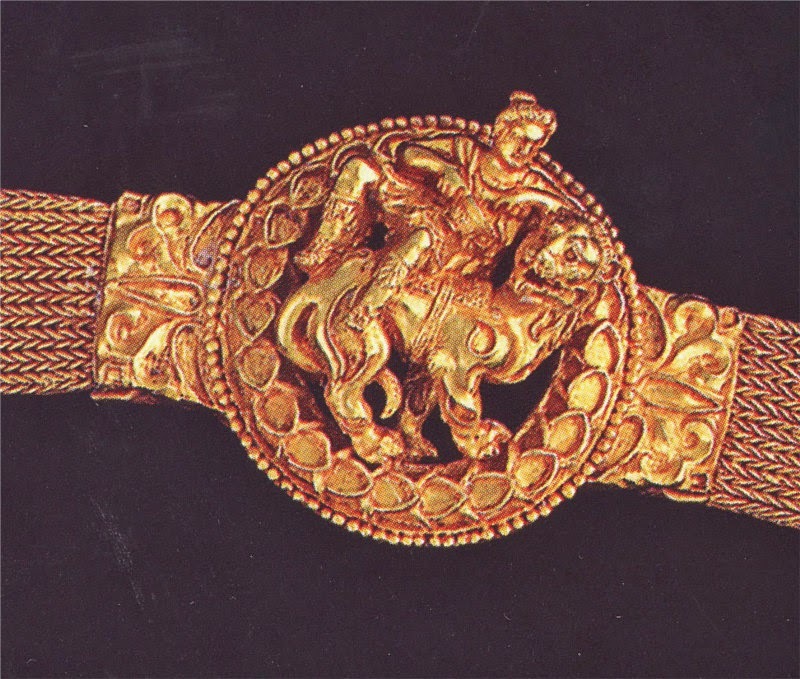 The medallions on this belt depict a god riding a panther, a pose often taken by Dionysus. The Greek kingdom set up by Alexander the Great in this part of the world lasted into the first century BCE. 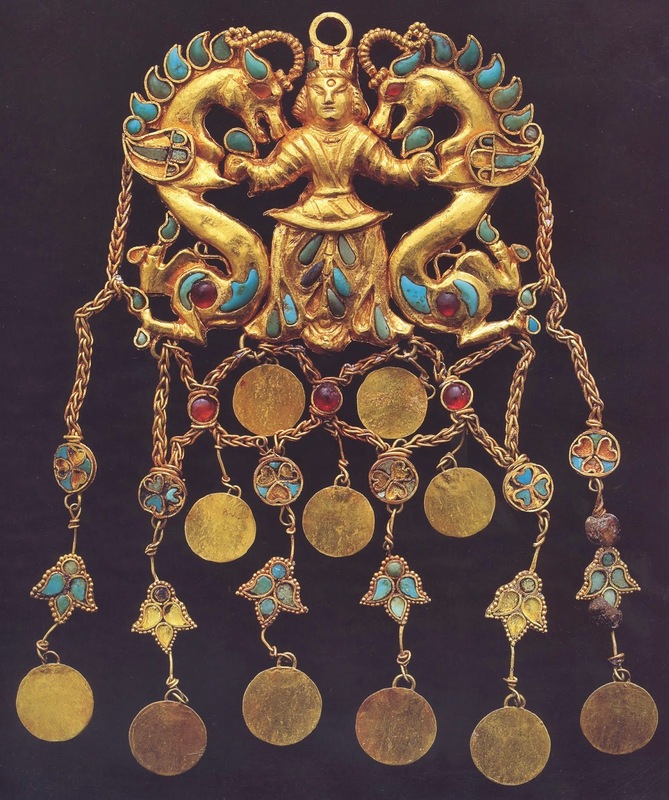 These pieces look like objects from Scythian or Sarmatian tombs. 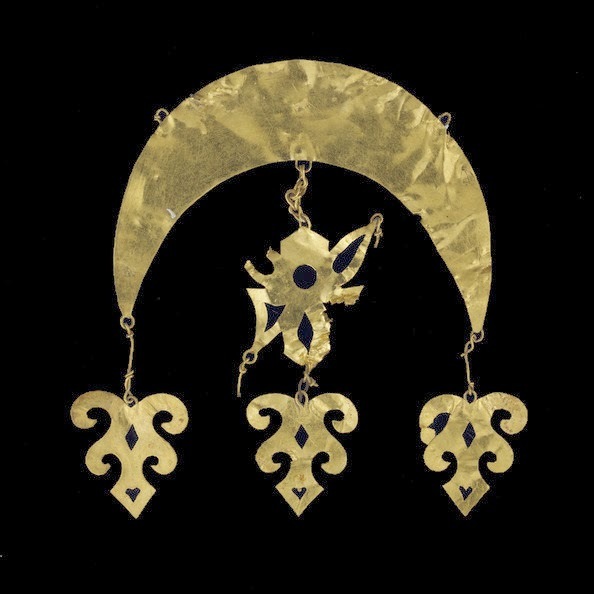 Hellenistic earrings and an ornament of unknown use, vaguely Chinese looking, measuring about 6 by 7 cm. The famous dragon master. Truly an array of wonders. Where is My Artificial Tree? I went through a phase in my childhood when I was going to be a great inventor. 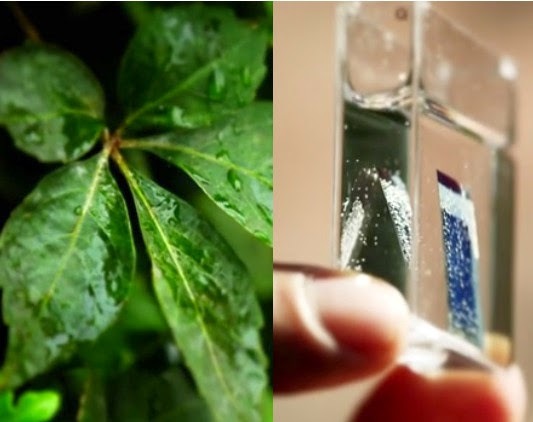 One of the things I imagined myself inventing was an artificial leaf, a system that would mimic the energy harvesting power of photosynthesis. I must have read in some children's science book, or perhaps in National Geographic, that this was a great goal for science that would revolutionize human society. So, all right already. Where’s my power station? It's the same story we have heard so many times in the field of alternative energy. From fuel cells to electric cars to natural gas from algae, we keep hearing about wonderful technical breakthroughs, but we still get most of our energy from fossil fuels. The first step in photosynthesis is the splitting of a water molecule to make oxygen and hydrogen. Nocera's chip uses catalysts and sunlight to achieve this same result. In a cell, the hydrogen is then reacted with carbon dioxide to make sugar. Nocera's chip simply pumps out hydrogen and oxygen. The process seems to work efficiently enough to be cost-competitive with natural gas or photovoltaic cells, although it's hard to know how well it would scale up. So if you installed a panel of these in your house, you would then have a steady supply of hydrogen gas. Have any use for hydrogen gas? That's the problem. To make use of this hydrogen, you would also need to install a bank of fuel cells to turn it into electricity, and either find a way to hook those fuel cells up to the grid or attach them directly to your appliances, and so on, all of which is doable but far from simple. The technology may be great, but the infrastructure to make good use of it does not exist. And that is a big hill to cross. Arnold Böcklin (1827-1901) was one of the leading Symbolist painters. Born in Basel to a mercantile family, he studied in Düsseldorf and then spent his life moving back and forth between Italy and the German-speaking lands. 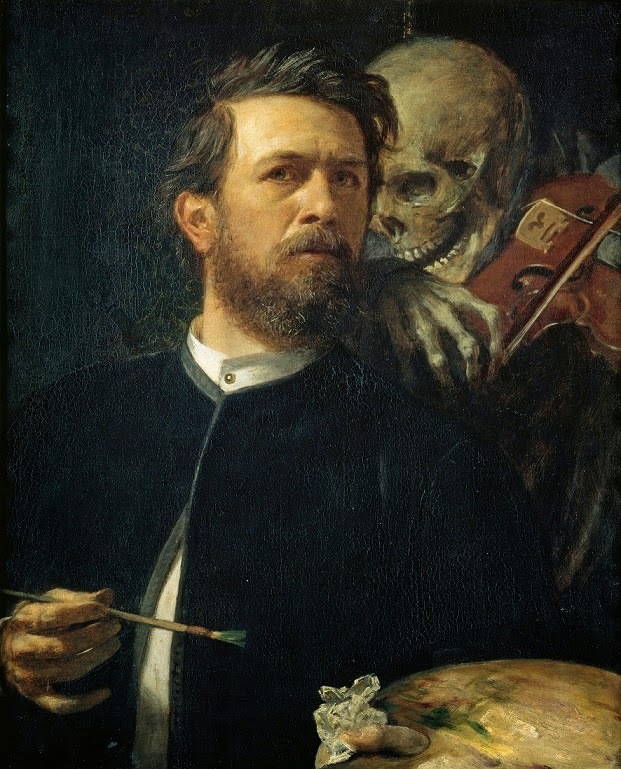 Above is his most famous painting these days, Self Portrait with Death as Fiddler, 1872. Detail of an early work, Willow the Wisp, 1862. He was fascinated by classical antiquity and most of his paintings depict either classical themes or Italian landscapes. 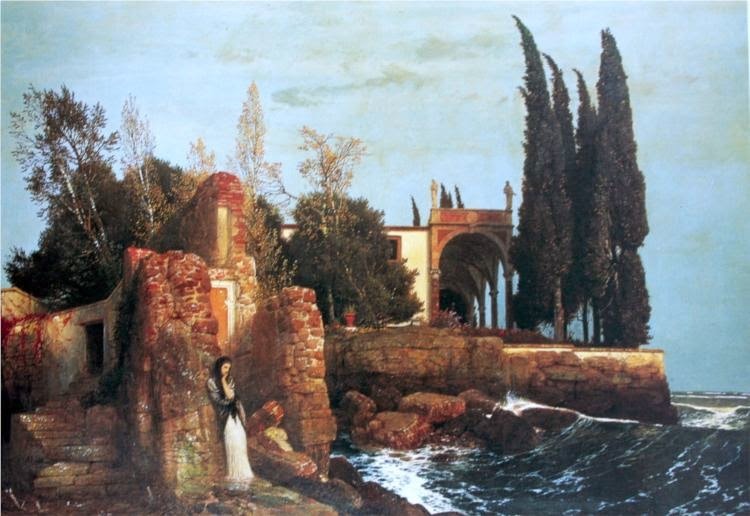 Villa by the Sea, 1878. The Lament of Mary Magdalene Over the Body of Christ, 1868. During his own lifetime his most famous works were probably his five renderings of the Isle of the Dead, the first painted in 1880. Sergei Rachmaninoff, Max Reger, and Heinrich Schulz-Beuthen all composed tone poems based on it. 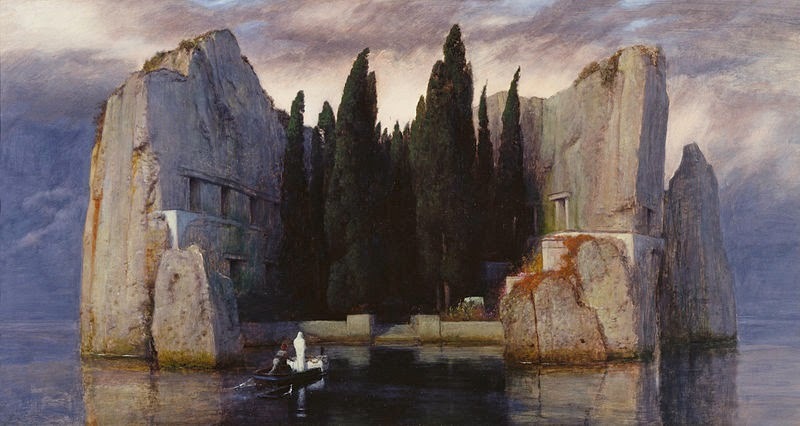 By the time of his death, Böcklin was one of Europe's most famous painters. 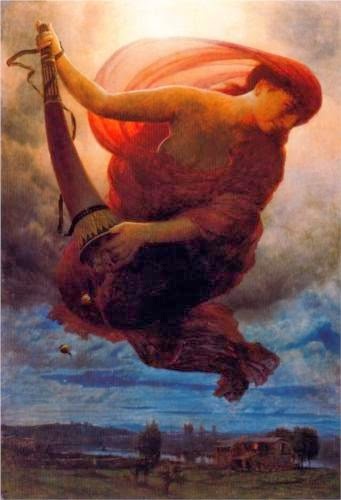 In 1904 Otto Weisert designed an Art Nouveau typeface and named it Arnold Böcklin. Night, 1895. Hitler was a huge fan of Böcklin, owning as many as 11 of his paintings. 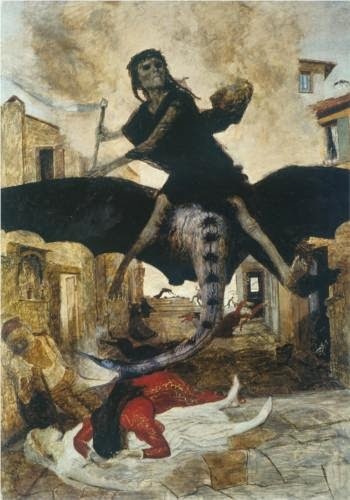 The Plague, 1898. 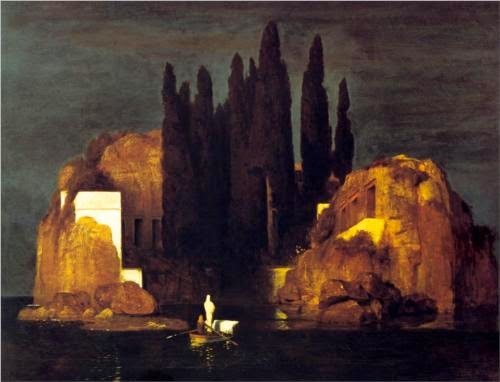 In the mid twentieth century Böcklin fell out of fashion like a rock dropped from the top of the Eiffel Tower. When Marcel Duchamp, a bellwether in these matters, was asked which other artist had had the greatest influence on him, he answered "Arnold Böcklin." Since Duchamp never gave a serious answer to any such question from a critic, we can assume this was irony -- and anyway it is absurd to imagine Duchamp being influenced by such a mystically-minded painter as Böcklin. 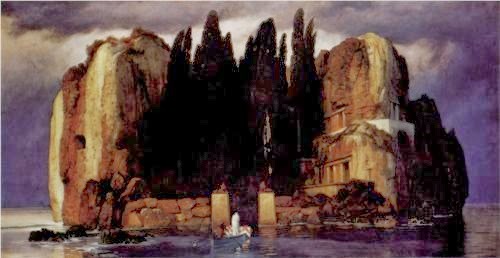 By 1947 modernist critic Clement Greenberg could write that Böcklin's work "is one of the most consummate expressions of all that is now disliked about the latter half of the nineteenth century." 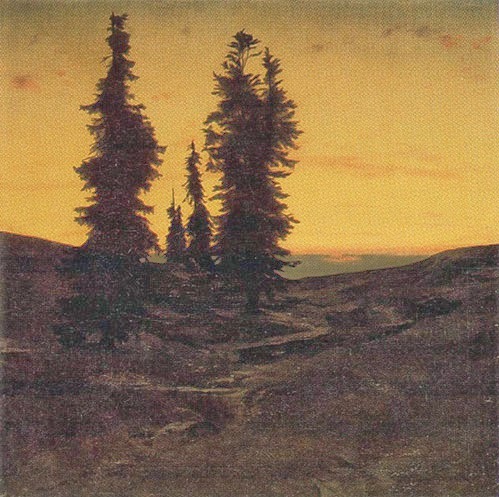 Above, Fir Trees at Sunrise. I find his many portraits tedious and unattractive, so I haven't reproduced any here -- only his portraits of himself sparkle for me. And as I have noted before, I don't really get Symbolist Art. 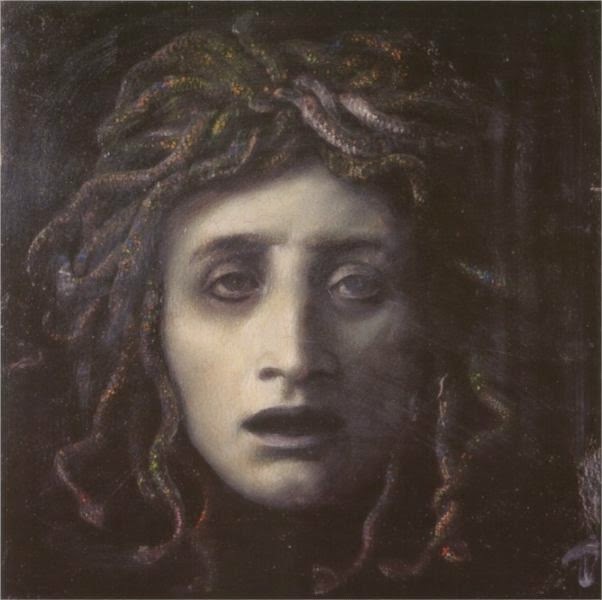 Still, Böcklin's best images, like Medusa, draw my eye and hold it and make me wonder. In New York, thousands of parents are opting to keep their children out of standardized testing. The website for the Institute for Collaborative Education, in downtown Manhattan, specifically invites parents of middle-school students to join the opt-out initiative, asking them to demonstrate support for the kind of teaching and learning the school provides, an approach that is antagonistic to rote test preparation. Finland often comes up when these questions are debated, and it seems to me that people are confused about what the Finnish example means. Finnish students regularly test as among the best in the world, but Finnish schools are not high-pressure knowledge crammers like those in Japan and Korea. They are much more laid back, with more emphasis on creativity, play, self-direction, all that good liberal stuff. But people holding them up as a model say we know they are good because of the test scores. So if Finnish schools are good, testing in itself can't be the problem; the problem would be a narrow view of what teaching students to do well on the test means. Honestly I doubt the curriculum really matters all that much. For centuries the Chinese trained their bureaucrats by having them read a set list of old Confucian and Taoist classics, then write about them in a highly structured form called the Eight Legged Essay that nobody ever used for anything but answering exam questions. This was regularly denounced as pointless, and in a sense it was, but on the other hand the Chinese state was probably the best run in the world. Early education in medieval Islam consisted largely of memorizing the Koran, but they led the world in science and mathematics. I am sure the schools my children attend could be better. But I really doubt there is much the president or the governor can do about it by tweaking the curriculum. Halfway through an otherwise coherent conversation with a Georgian lawyer here I was startled by a comment he made about his country’s former government, led by then-president Mikheil Saakashvili. “They were LGBT,” he said, conspiratorially. What did that mean, I asked, surprised. Were they for lesbian, gay, bisexual and transgender rights? For gay marriage? Were they actually gay? He couldn’t really define it, though the conversation meandered in that direction for a few more minutes, also touching on the subject of the former president’s alleged marital infidelity, his promotion of female politicians, his lack of respect for the church. Afterward, I worked it out. The lawyer meant to say that Saakashvili — who drove his country hard in the direction of Europe, pulled Georgia as close to NATO as possible and used rough tactics to fight the ­post-Soviet mafia that dominated his country — was “too Western.” Not conservative enough. Not traditional enough. Too much of a modernizer, a reformer, a European. In the past, such a critic might have called Saakashvili a “rootless cosmopolitan.” But today the insulting code word for that sort of person in the former Soviet space — regardless of what he or she thinks about homosexuals — is LGBT. As Applebaum says, Vladimir Putin and his friends do not have any sort of coherent ideology. 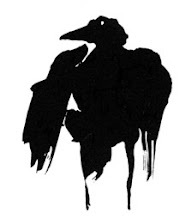 They are guided by an attitude toward the west that mixes wounded pride, distrust, and contempt. They despise the shallow consumerism of western culture, the public sleaze, the petty vote-grubbing of politicians who seem more like salesmen than statesmen, etc., in short, all the stuff that anyone of conservative temperment despises about the west. Some of them also hate the secularism, others the pacifism. These attitudes push them toward nationalism and authoritarian politics. But without any more expansive ideology to guide them, it seems unlikely they will be much of a threat to the world. Local news story on the Patterson Park dig can be seen here. During the 17th century, longer winters and cooler summers disrupted growing seasons and destroyed harvests across Europe. It was the coldest century in a period of glacial expansion that lasted from the early 14th century until the mid-19th century. 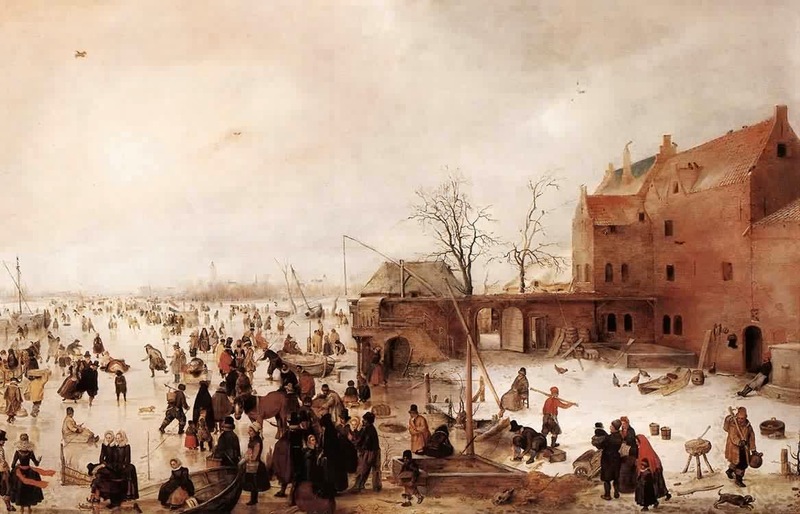 The summer of 1641 was the third-coldest recorded over the past six centuries in Europe; the winter of 1641-42 was the coldest ever recorded in Scandinavia. 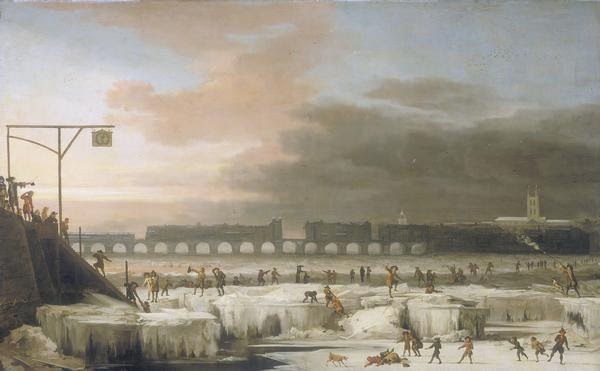 The unusual cold that lasted from the 1620s until the 1690s included ice on both the Bosporus and the Baltic so thick that people could walk from one side to the other. The deep cold in Europe and extreme weather events elsewhere resulted in a series of droughts, floods and harvest failures that led to forced migrations, wars and revolutions. The fatal synergy between human and natural disasters eradicated perhaps one-third of the human population. . . .
Western Europe experienced the worst harvest of the century in 1648. Rioting broke out in Sicily, Stockholm and elsewhere when bread prices spiked. In the Alps, poor growing seasons became the norm in the 1640s, and records document the disappearance of fields, farmsteads and even whole villages as glaciers advanced to the farthest extent since the last Ice Age. One consequence of crop failures and food shortages stands out in French military records: Soldiers born in the second half of the 1600s were, on average, an inch shorter than those born after 1700, and those born in the famine years were noticeably shorter than the rest. Like many historians and archaeologists, I have lately been thinking hard about climate and its effects on human civilization. The archaeological record is full of what look like population booms and busts, and shifts in the climate are often suggested as the cause. 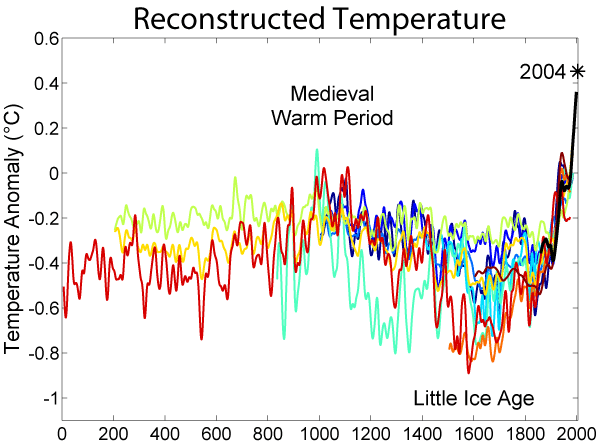 As you can see from the wikipedia chart above, which overlays ten different reconstructions of the climate over the past 2000 years, there have indeed been broad shifts in the climate, and the Little Ice Age stands out as one of the most dramatic. On the other hand you can also see that various reconstructions differ greatly in detail, both in terms of the timing and the severity of these fluctuations. Quite likely this is because the effects of these cycles varied greatly from place to place. This variability is one problem with Parker's reconstruction of a Europe-wide catastrophe. If a year was colder and wetter than normal, that might be catastrophic in parts of northern Europe; but why would it be catastrophic in the south, where crops were more often threatened by drought? A list of famines and riots proves nothing, since crops failed somewhere in Europe every year. The 17th century was indeed a time of great turmoil across Europe. But how much of that was due to climate change? This, I submit, is a hard question. The great disturbances of the age were not acts of random violence, but expressions of profound political and intellectual changes. The causes (perhaps) of these conflicts included the re-establishment of strong national governments after a millennium of weak central power; rivalry between these nations for pre-eminence in Europe; conflicts inspired by the attempts of these newly strong states to control the church within their borders; and conflicts over what form that church would take. It was a time of great ideological ferment, giving us both radical democratic agitation and the most fantastic assertions of "absolute" royal power. Was all of that, as a Marxist might say, mere superstructure over a deep roiling of the continent caused by crop failures, famine, and hordes of wandering beggars? Or, if we don't want to go that far, could we say that people are more prone to embrace radical ideas when the existing systems are obviously not working? 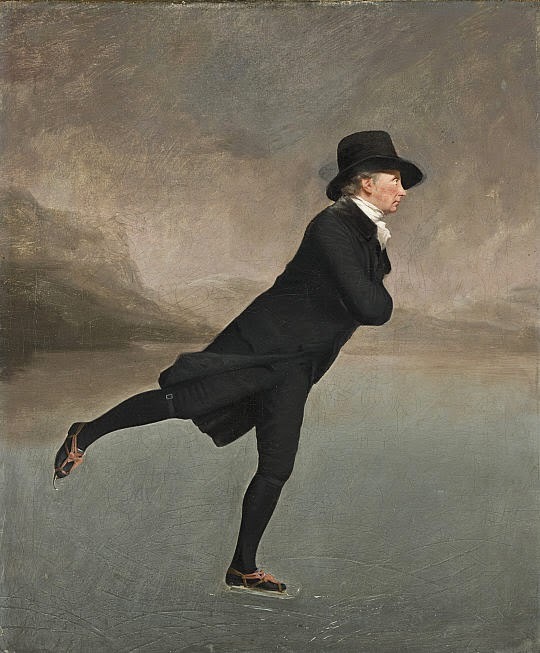 There were, it is worth pointing out, two very cold periods within the long span of the Little Ice Age -- in Northern Europe anyway -- and the second was precisely the revolutionary epoch of 1775 to 1825. Against this we might argue that the overall structure of European population was governed by the iron scissors of Thomas Malthus. In good times, population rose until it reached a sort of limit set by the overall productive capacity of the civilization. Thus in the Middle Ages technical advances, increased order, and better weather led to a long span of population growth that lasted from about 1000 to 1250 or 1300. By 1300, the continent was full, and there was bound to be increased conflict over resources whether the weather changed or not. The bad weather of 1315-1317 led to famine across the north because the system was already strained to the limits, and it remained strained to the limits until the Black Death came along and swept a third of the continent away. The 16th century was another era of growth, caused (it seems) by a decrease in the virulence of the plague. (Evolution of biological defenses? Better quarantines and other measures? Changes in the disease organism itself? Nobody knows.) By 1600 the population was once again pressing against those Malthusian limits. Another important caveat can best be explained by the events of the 20th century. Europe went through another revolutionary epoch between 1914 and 1968 or so that had nothing to do with bad weather. This was a crisis entirely caused by the internal development of European civilization and the world economy. Could such things happen only in the modern, industrial era, or might past civilizations have generated their own crises? One final point: is a crisis necessarily a bad thing? No doubt the Little Ice Age was bad for people who starved, went hungry or were killed in riots, but if the atmosphere of crisis helped inspire the era's radical political and scientific thinking, then much of our modern world traces back to a cold spell. Whatever else happened in 17th-century Europe, it was an era of extraordinary accomplishment in art, mathematics, science -- especially physics, physiology, and economics -- exploration, global trade, technology, and more. I know I have said this before, but it bears repeating that the droughts some people think led to the collapse of Mayan civilization were no more severe than the Little Ice Age, which had rather the opposite effect on Europe. I am not entirely sure what I think about all of this, but "climate change is bad for us" strikes me as far too simple. The Synodus Horrenda, usually known in English as the Trial of the Cadaver, was held in Rome in January 897. The new Pope, Stephen VII, put the corpse of his deceased predecessor Formosus on trial for perjury, simony (buying church offices), and other offenses against "Reason and the Canons of the Church." This was a tough era for the papacy, as the collapse of Carolingian imperial power left the office in the hands of squabbling factions in Rome. Several popes came and went quickly. The future Pope Formosus had actually been excommunicated by one of his predecessors, John VIII, for (among other things) "perverting the Bulgarians." Formosus came into office hurling accusations against the recently dead John VIII and promising to undo his crimes. But Stephen went one better by actually putting Formosus' body on trial. Since he could hardly defend himself, Formosus was not surprisingly found guilty, and his entire papacy was declared null and void. 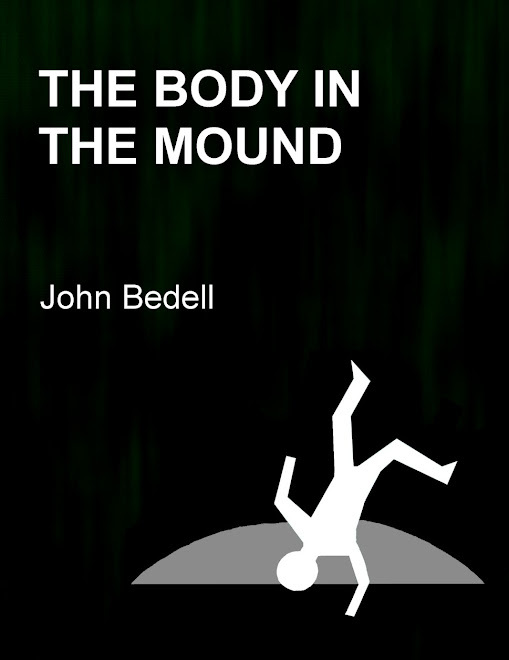 The convicted body was thrown in the Tiber. By December, though, Stephen himself was dead, and Formosus' friends set about rehabilitating him. 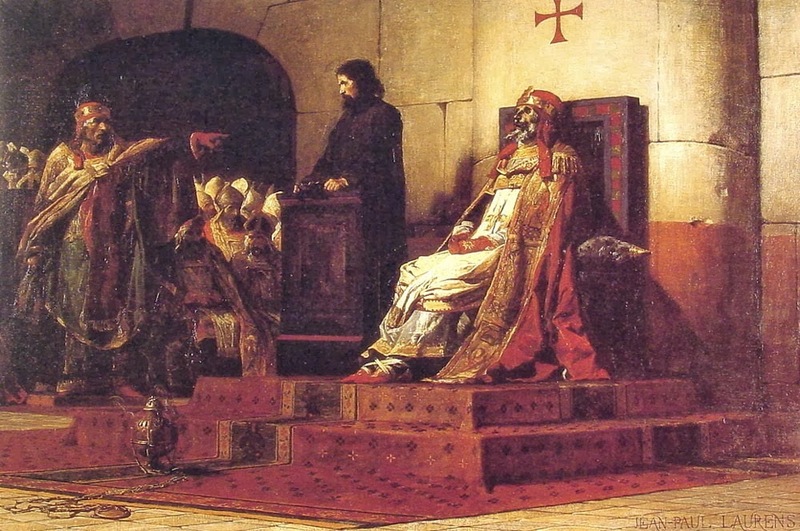 Pope Theodore II convened another Synod in which he overturned the conviction of the corpse. Formosus' body -- or what was said to be Formosus' body, anyway -- was retrieved and buried in St. Peters. This synod also passed a law forbidding any future trials of the dead. Painting by Jean-Paul Laurens, 1870. Any theory that presents itself as absolute -- for example Christianity or Marxism -- sooner or later ends up justifying crime and lies. The Times has an article today on the supposed archaeological site of Serra da Capivara in Brazil, which partisans say is at least 22,000 and maybe 30,000 years old. If people were in the Americas 22,000 years ago, where are their remains? Even if you add together all the claims of pre-Clovis humans in the Americas you still only have a handful of sites representing a few hundred people. You're telling me that humans managed to live all across the Americas for 8,000 years while leaving virtually no trace of themselves beyond a few broken rocks and butchered bones? Consider, by comparison, the evidence for entry around 13,500 years ago, the "Clovis First" model. At that time the human population began to grow exponentially, dozens of species of animals went extinct, the number of forest fires increased, and the record of human presence is dense across the landscape. 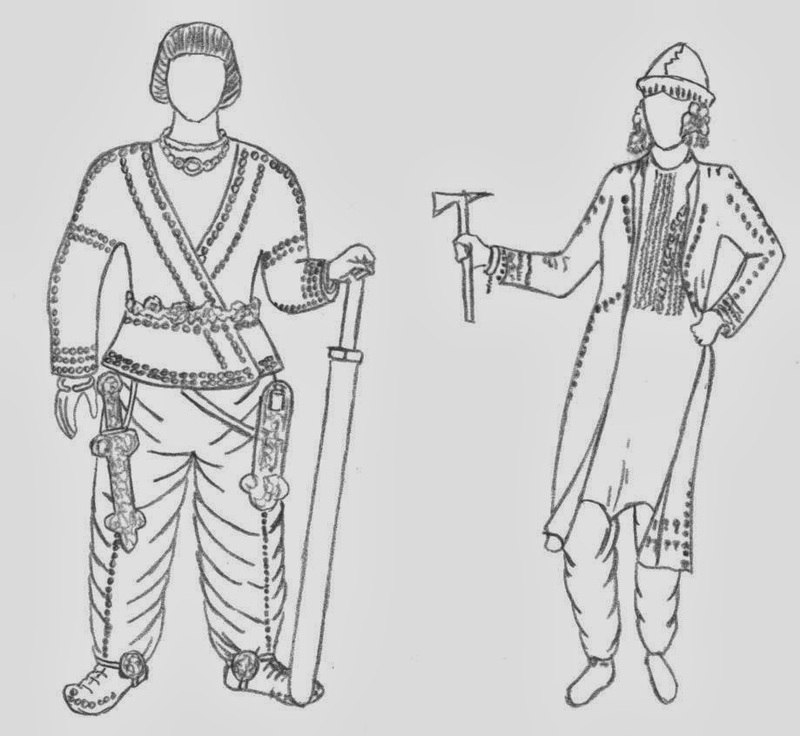 There are hundreds of Clovis sites and thousands of Clovis spear points. 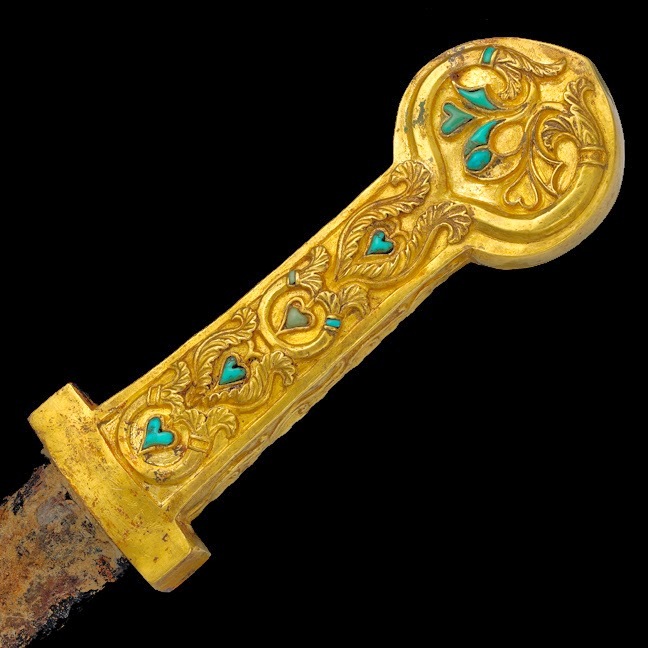 Within 3,000 years, in the Early Archaic period, the population had grown so much that there are tens of thousands of sites and hundreds of thousands of spear points. The Clovis culture can't represent the first people in the Americas, since it originated in North America. But if you ask me it most have come early in the sequence. I can easily accept that people arrived 500 years before the Clovis explosion, and I might be willing to grant a thousand. But beyond that it strains credulity to imagine people wandering all over two continents, leaving so little record and having no impact on the environment. Plus, the DNA from the Anzick Baby confirms that Clovis people were close to the genetic origin of all Native Americans, showing once again that if there were people around before, say, 14,500 years ago, they somehow mysteriously died out, leaving no descendants. 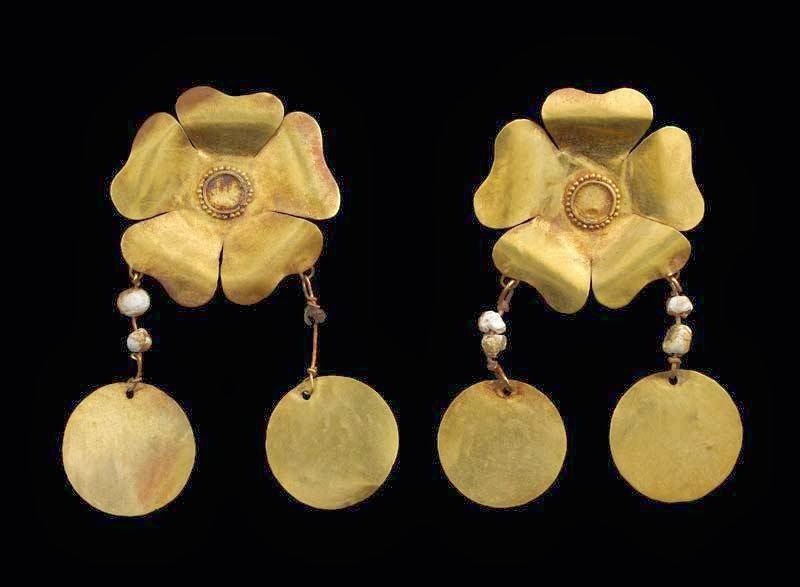 adds to the growing body of research upending a prevailing belief of 20th-century archaeology in the United States known as the Clovis model, which holds that people first arrived in the Americas from Asia about 13,000 years ago. No, no, no. Clovis First is not now and has never been the consensus view of archaeologists. The view that humans were here in the Ice Age is actually older, and the two ideas have been in conflict ever since Clovis First was proposed. I am not even sure that it has ever been the majority view. Plus, comparison of skulls? That's nineteenth-century pseudo-science. We have DNA now to look into these questions, and it says unequivocally that all Native Americans are descended from the same small group of Asian migrants. The Times does quote two archaeologists who are critical of the supposed Serra da Capivara artifacts: Gary Haynes, who says they are natural, and my colleague Stuart Fiedel, who notes that they might have been made by monkeys. 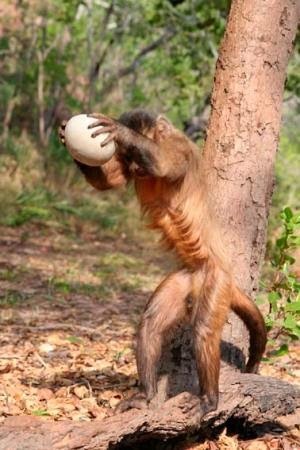 Fiedel's old enemy Tom Dillehay of the Monte Verde pseudo-site says that the monkey idea is "stupid," but why? 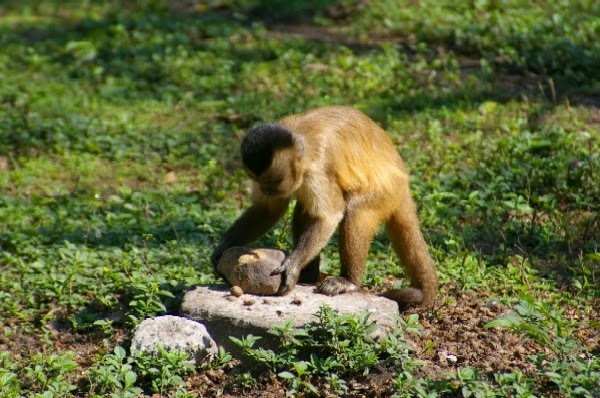 We know that modern monkeys can make and use tools, so why not monkeys of 22,000 years ago? No, it isn't, and it won't be until somebody can offer another explanation of why the Americas were so different after Clovis than they were before. For this is an unfortunate, ahistorical, heretical bedrock belief of the conservative base: the American economy is God’s economy. Any attempt to regulate it is contrary to the God-breathed Constitution. It is atheistic, humanistic, and tyrannical. I got to Patterson Park early yesterday morning so I took a walk about the neighborhood just to the west, which is called Butchers Hill. I haven't been in that part of town in twenty years, and it has come up a long way. The ones on the side streets are small. With grander houses on the main streets. Side by side, two different approaches to renovation: on the right, the neo-Federal; on the left, the retro-1950s formstone look. A delightful place, perfect for my fantasy second life in which I am a cool urbanite. "Levels of Inequality Never Before Seen"
Who Would Benefit from Raising the Minimum Wage? Who has the right to be independent?